I’m so excited to see you here at Whimsy Wednesdays, a fabulous link party with hundred of recipes, crafts, DIYs, tips, tricks, and other projects linked up by some of the best bloggers on the web. We go live at 6:45 pm ET every Tuesday night. Hopefully you’ll find some great ideas, and if you are a blogger yourself, make sure you link up your recent projects! With this great lineup of cohosts, you have the opportunity to have your projects featured on the social media accounts of foodies, crafters, DIYers and more! I’m the foodie of the bunch, so I’ll be pinning all of my favorites to my Whimsy Wednesday Deliciousness board, sharing on my Facebook page, and each week I’ll not only feature my absolute favorite on the main page of the party, but I’ll also be looking for recipes to include in roundups right here on Cupcakes & Kale Chips, plus in my weekly roundup on Parade’s Community Table. 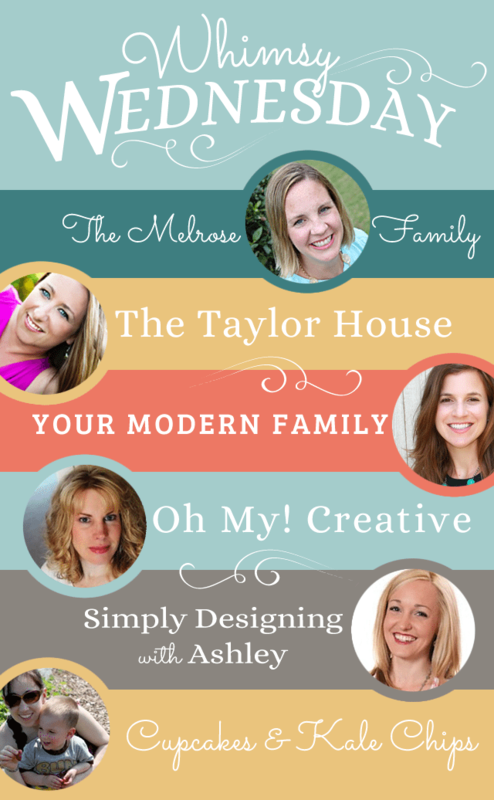 Hop on over to The Melrose Family, The Taylor House, Your Modern Family, Oh My! Creative, and Simply Designing with Ashley to find out more about you other opportunities to be featured and shared across the web. Also be sure to follow the hashtag #WhimsyWednesdays for all things related to the party! Please be aware of the Rules of the Party and abide by them! Please do not link parties or shops. Everything else is accepted. Please be aware that by sharing at Whimsy Wednesdays, you are giving permission for your projects to be shared on social media and in round up posts on any of the cohosts sites as well as on Parade’s Community Table website, which will be pinned using a scheduling tool for maximum exposure. The feature will include a link back to you. DO NOT link up photos that you have purchased and do not have permission to share.